The filling is really what makes this cutlet’s flavor so bold. It’s packed with fresh vegetables for a wide variety of textures and flavors, along with some potato for balance. 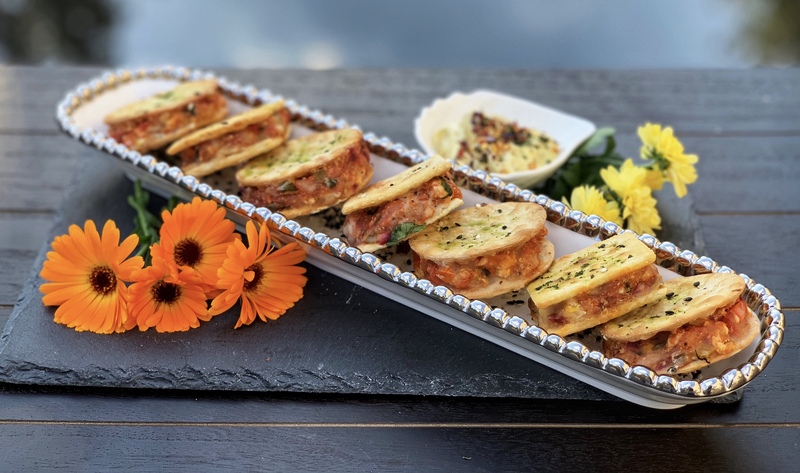 Now the really interesting thing about this is that it uses daily and common items like crackers and elevates them to a gorgeous party appetizer. These cutlets have a great balanced taste, which is a great start to a meal. While they do have a bold filling, the cracker outside creates a more neutral and complex palette. Paired with a tangy mustard aioli, the impeccable flavor, simple preparation, and available ingredients make this an awesome appetizer! Baked Cracker Cutlets - a delightfully yummy cutlet made by sandwiching a vegetable medley filling between crackers, this easy appetizer is baked to perfection. Pair this with a tangy mustard aioli for an awesome appetizer for your party! Heat oil in a pan over medium heat and sauté carrots, bell peppers, ginger, green chilies, and corn for 5 minutes. Add in paneer, potatoes, and beetroot. Also, mix in salt, red chili powder, mango powder, chaat masala, lemon juice, and cilantro. Make sure to mix well and sauté for another 4 minutes. Take the filling out into a large bowl and add some cheese. Allow it to cool and check the seasoning or adjust it based on your preferences. Meanwhile, preheat oven to 350oF. Mix the cornstarch and water, making a slurry. It should be at a buttermilk consistency, not too thick or thin so it just seals the cutlet together. Sandwich about 1 tbsp of filling between two crackers, it should be approximately 1/2 to 3/4 inch thick. Now, with the help of a brush or small spoon, gently drizzle the slurry around the edges of the cutlet to make sure it holds its form. Continue this process until the filling is over or until you have your desired amount. Arrange the cutlets on a baking sheet. Melt butter and brush each cutlet with it. Sprinkle some herbs and sesame seeds on the cutlets, and bake them for 10-15 minutes. Garnish with fresh basil or any herb and enjoy! For mustard aioli, whisk mayonnaise, mustard sauce, salt, pepper and garlic powder together. If you like, add 1/2 tsp honey for a hint of sweetness. These can also be fried instead of baked. If you don't like potatoes, you can make the entire filling from paneer. You can also serve them with any sauce or chutney of your choice. Looks great, can’t wait to try this! Yes do give it a try. Hope you love it as much as we did!! Thank you so much. So happy to hear that!! I’m thinking of trying this with tofu instead of paneer to make it vegan, maybe some nutritional yeast instead of cheese. Sounds interesting. Yes absolutely you can do any filling of your choice. Just keep in mind that the filling is dry. Take extra firm tofu and take out extra water with the help of kitchen towel by pressing it gently and then crumble it. Make the filling with all veggies and any spices or herbs of your choice. It’s an excellent appetizer you will love it for sure! Aww thanks. They are delicious you will surely love it. Waiting for pics…! !